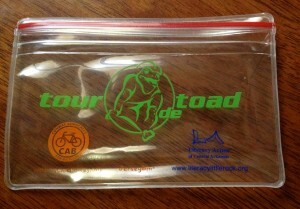 I forgot to mention the goodies I received from the Tour de Toad. No good charity ride is without some stuff for you to take home. The Tour de Toad hooks you up with a cool jersey bin. Basically a tough plastic bag that keeps stuff in your jersey pockets from being covered in a lovely layer of sweat upon your return from a long, hot ride. The Ride, Conway’s awesome local bike shop, provided these sweet Specialized water bottles. It’s a water bottle, so there’s not really much to say about it, but having extra bottles is never a bad thing. Especially if they can be obtained for free. Recently, my handlebar tape has started to show signs of wear. There are little chunks taken out here and there, the tape is getting thin in the places I often hang on and one side of the tape is starting to slip and slide too much for my liking. 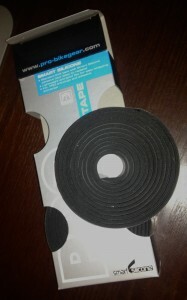 So, I thought it was time to try my hand at another piece of bicycle maintenance: installing fresh bar tape. I haven’t actually done it yet, but I’ve been reading up and watching endless YouTube videos on how to do it just right. Anyway, this resulted in a trip to Spokes, the awesome bike shop just a hop, skip and jump away from my office in Little Rock. I asked for some cushy, easy to install bar tape and ended up with the Pro Smart Silicone tape pictured below. Of course, I’ll update you on how the actual taping process goes. Wish me luck. While at Spokes, I did some more looking around and stumbled across a couple cycling caps. I’ve needed a nice cycling cap for a while. My mid-week rides all take place early in the morning and while it’s usually nice and cool that early, there are two things that make riding somewhat troublesome: the sun coming up and humidity. The humidity wreaks havoc on me because of my odd glasses set up. I’m a near-sighted individual who where’s prescription glasses. I also enjoy cycling, so I need a good pair of sunglasses. Well, last year I discovered Rudy Project’s solution to this. Rudy Project offers their regular sunglasses, with a prescription clip in that sits behind the sunglass lenses. This enables you to swap out the sunglass lenses, but keep your prescription. They work just fantastically, unless the humidity creeps up to 90 percent or more. At this point, they fog up like crazy. I’m no scientist, but I’m guessing it’s because of the double lens situation. I’ve taken the prescription insert out and had no problems (except for my poor vision). Because I’d rather be able to actually see when I ride, I usually just pop the sunglass lenses out and basically roll around with an oddly sporty looking set of prescription glasses. I could wear my normal glasses, but they’re not really cycling friendly. This leads to my need of a cap to keep that sun out of my eyes. I have a winter cycling cap, but on mornings when it’s in the 60s and 70s, I don’t really need a thick cap with ear flaps. 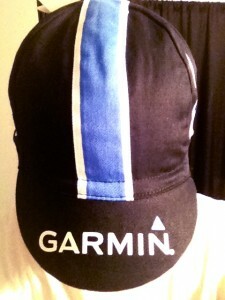 I settled on the Garmin Cervelo cap pictured below. They had a plain black cap with white stripe, which I actually preferred (I’m a graphic designer, minimal is beautiful in my opinion). But, the Garmin cap was a couple bucks cheaper, it was a Castelli cap and it actually looks pretty good. I’ll probably give the cap it’s test run this afternoon. It’s rainy this morning in Conway, and I’m trying to plot out the perfect ride time to avoid rain. That may not be possible, so the cap will probably be coming with me to keep the water out of my face.